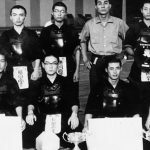 In 1960, at the 8th edition of the All Japan Championship, a player in his 20s reached the top for the very first time, Up until then, all champion players were above 30, and all had experienced kendo during or before the war. 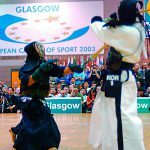 Kuwahara belongs to the generation that began kendo after its ban was lifted post-war. Kuwahara was 21 years and 9 months old when he won the championship. In 1976, Tetsuo Kawazoe won it at 21 years and 10 months, but Kuwahara’s record for the youngest winner stood for over hald a century until 2014 when Yuya Takenouchi won it at 21 years and 5 months old. Kuwahara was born in Wakamatsu city (currently part of Kitakyushu City) in Fukuoka prefecture. He was the 2nd out of 4 male siblings, and all 4 of them played kendo. They were known as the 4 Kuwahara boys. During his Wakamatsu High School years, he reached the final of the Gyokuryuki Games two years consecutively, and made a name for himself with the shinai games too. After graduating, he worked at Asahi Kasei in Nobeoka city, Miyazaki pref. 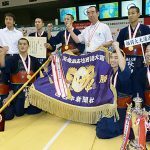 Asahi Kasei was putting an effort into strengthening their kendo team, gathering competent kenshi from Miyazaki as well as all over Kyoshu. These players worked from 7:30 am to 3:30 pm, then practiced kendo from 4:00-6:00 pm. 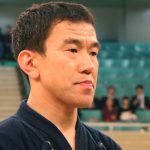 They invited Tomoyoshi Kondo, who had taught at Martial Arts Special School, as their hanshi, and had high dan-holding employees and ex-employees joining practice. At the competition, Kuwahara defeated many skilled kenshi one after another. 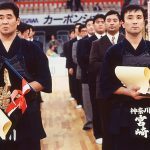 Ryokichiro Tani (Aichi), Masaharu Sonoda (Osaka), Eihachi Takizawa (Hokkaido), Michio Kawasaki (Saga), Yoshihiko Oura (Fukuoka), Tetsujo Uramoto (Osaka) were all kanshi who would become well-known instructors in their respective regions. In the final with Uramoto, Kuwahara went for the do, and as Uramoto try to guarded, he got the hiki-men for the win. “I think youth was the key factor in winning. I was at least 10 years younger, so my quickness was different. Each of my moves was waster than the moves of others”, Kuwahara recalled many years later. A championship win for a 21 year old youngster was shocking news. “The kendo world must have been astonished” wrote Masanori Yuno (who would later become an 8-dan hanshi) in “Kendo Times”. Coincidentally, at the Kyushu tournament for Sumo was won by Taiho, claiming his first title. 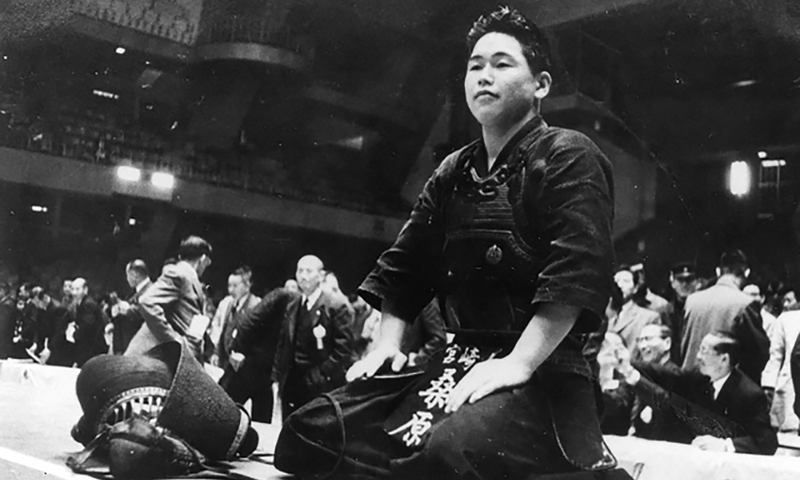 Still in the position of Sekiwake, Taiho would later become one of the greatest Yokozunas. The sports newspapers lined up the two youngsters and reported that “a new wave is coming through for sports”. In the All Japan Championship two years later, Tadao Toda (Tore-Shiga), who is the same age as Kuwahara, claimed the title. 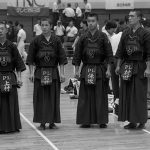 From the mid-1960s, it was those in their 20s who would come to dominate the kendo world.